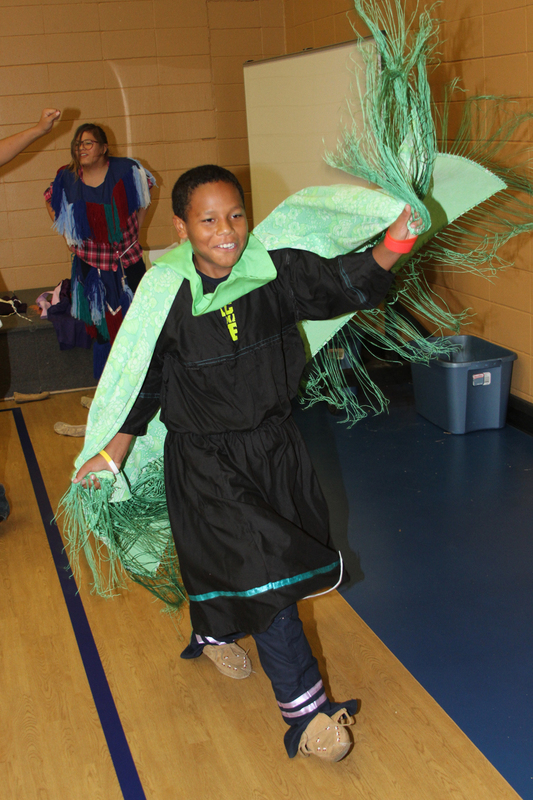 Monday, October 14, St. Joseph’s Indian School – along with the rest of South Dakota – celebrated Native American Day. We, along with several other schools around our area, embraced the opportunity to have a “teachable moment” while having fun reliving a part of our rich Lakota/Dakota/Nakota culture. In the Regalia Relay, the Lakota boys put on girls’ regalia and vise versa to dance their way back to their teammates. The morning greeted us with a line of colored banners carried by students who read a brief description about the corresponding color and direction of the medicine wheel. Bridges were built between the Catholic and tribal spiritualities by centering ourselves with prayer and singing the hymn “There is a Well.” Our drum group offered up two prayer songs to honor the day and what it might mean to our people. Each game was explained with its historical significance and natural place in our world. A plethora of adults helped to make the day possible by guiding, encouraging, and even taking part with the group as the students scurried through the rain and mist between the recreation center, the Akta Lakota Museum & Cultural Center and the skating room. I hope our St. Joseph’s students went home knowing why this day was set aside for our tribal people to be honored for our place on this North American Continent, rather than focusing on someone who thought they had found India. We love the land and the culture that respects our footprints upon it. Leg wrestling was one of many games played in traditional Lakota (Sioux) culture. I used to leg wrestle in school and loved it. Must say I thought I was pretty good at it. Glad to see it is still just as much fun. Thank you for sharing. I will try to donate in Nov. God Bless you all! Thank you for your kindness Theresa! I remember this kind of legwrestling from my childhood.